With only 62 calories per serving, these Parmesan Roasted Campari Tomatoes are a perfect vegetarian summer side dish or salad topper. Summer is my favorite time of year, not just for the obvious reasons…I’m simply in love with the produce!!! With access to farmer’s markets galore, I cannot eat what I buy fast enough. Living in NJ, tomatoes are a wonderful part of our summer bounty. These Parmesan Roasted Campari Tomatoes are a tasty side dish, or great addition to pasta dishes or Caesar salads. I like things spicy so I add red pepper flakes, if that’s not your taste preference, simply omit them. With only 62 calories per serving, you can certainly enjoy a few extra with no worries. The recipe is also gluten free to appeal to any family members or houseguests who need to avoid it. What are your favorite ways to enjoy summer tomatoes? Place tomatoes cut side up on a baking sheet covered with nonstick foil, or aluminum foil sprayed with nonstick cooking spray. 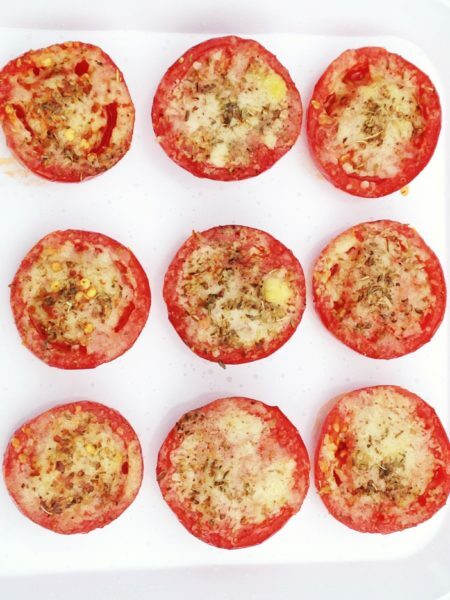 Sprinkle parmesan cheese, oregano, and pepper evenly over tomatoes. Carefully drizzle on olive oil, and add red pepper flakes if desired. Roast in the oven for 10-15 minutes, long enough for cheese to get melty and lightly browned but before tomatoes become mushy. Oooh yum! I love putting cheese on tomatoes and baking them.. so yummy for the summertime!